Druki Martenstyne's son Jason died in September 1995. Her husband, Cedric, went missing in January 1996. "I know the pain," she says. "I've suffered my son dying, and that we can accept -- we can move on and go back to our memories. But not knowing is something very, very difficult. Some people say they have seen him in chains, but I don't know how far that is true." "The worst horrors of war are often visited on the most innocent. 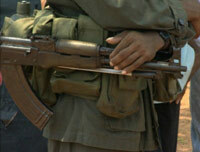 A painful portrait of Sri Lanka's civil war."